You would never try to run 10 miles on day one, right? When you do too much too soon, you’ll end up sore, injured, and discouraged. Take it easy as you get started. Depending on your fitness level, this may mean starting off with a daily 30 minute walk and increasing the pace gradually. Do different types of workouts to keep things interesting and to exercise different muscle groups. If the elliptical machine is usually your thing, hop on the stair climber for some cardio instead. Also, switch between machines and free weights when you’re strength-train. Try out a boxing classes or yoga on the beach. Add in fun activities like hiking with friends, stand-up paddle boarding or kayaking. You don’t have to reinvent your entire routine every week, but you do want to shift it around a little. When your inner demons order you to hit the couch instead of the treadmill, a workout partner can steer you back in the right direction. It’s easier to bail out on the gym than on the friend who waits for you there. 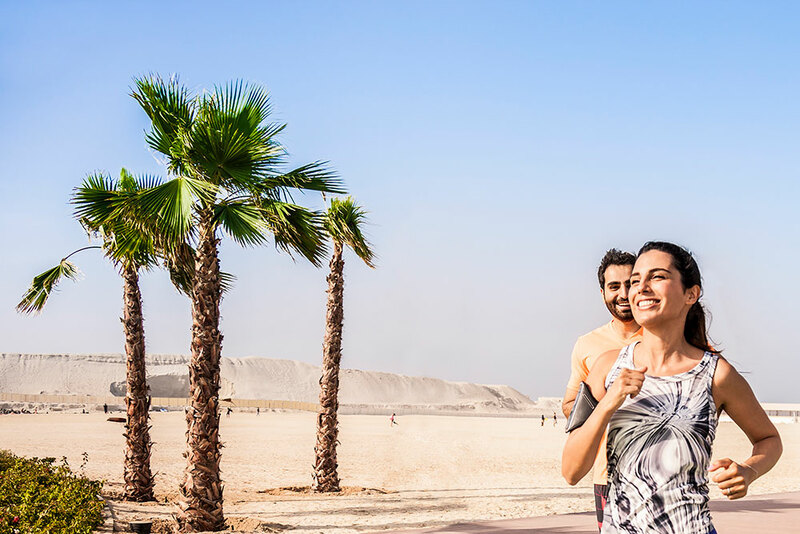 Make it part of your social calendar, instead of meeting up for a coffee and cake, meet your friends for a walk on the beach, a Pilates class or a game of tennis or football. Studies show you’ll also work out longer when you have a pal along. Show the clock who’s boss. Health experts say you should aim for at least 150 minutes of exercise a week (30 minutes a day, five times a week, for example), plus weight training at least twice a week. Can’t find room in your crazy schedule? Take a closer look. If you work too late to get to a gym, keep a set of weights at home. If you can’t do 30 minutes at once, break exercise sessions up into 10- or 15-minute bursts. Take the stairs instead of the elevator or walk to drop your kids off at school if you can. Make exercise part of your normal daily routine and you are more likely to keep to it. So what if you missed a week at the gym and polished off a pint of ice cream over the weekend? Leave the guilt in the past. You have a chance to get back into your routine today. If your body is telling you to rest then take some time out of high impact exercise, take it easy until you feel better. Treat any injuries and don’t push through the pain. Speak to a doctor at Health at Hand and we can help get you back to your normal routine as quickly as possible so you do not lose your motivation. Keep a fitness journal or use an app to record your progress — for example, how much you run, walk, or lift and the calories you burn. Also track what you are eating. Eat healthy balanced meals and control portions, try not to restrict yourself too much and enjoy cheat days or cheat meals, just not too often. It takes weeks to see real changes. Even a pound of weight loss or a pound of muscle gain is reason to reward yourself. Go out with friends, or spring for a new pair of jeans. Speak to a Health at Hand doctor now using video consultation. Give it a go and sign up today! Copyright © 2018 Health at Hand. All rights reserved.